One of the main reasons to use GardenCAD is that documenting site layout prior to creating your design solution becomes a precise science. In this module, we discuss the various ways you can document the geometry of your site and create an accurate base plan. 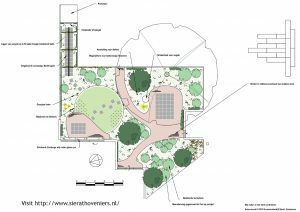 We hope that in time, you will gain enough confidence with GardenCAD to take a notebook computer with you when you go on site. You will be able the complete plan on site and check it for accuracy. There is nothing more frustrating than to have to make a return visit to add a critical dimension that you did not take. Take ruled graph paper with you, a long measuring tape, scale rule, pencil and eraser. For most purposes, you can let each square on the graph paper represent one square meter. We recommend that you use a scale of 1:100 for most medium to large scale gardens. We suggest drawing the footprint of the house first, then use offsets and triangulation to locate the house on the block, any important features such as major trees and the boundaries. If you are creating a mud map, take more triangles than you think is necessary to complete the accurate map.